Join Rajeshwari Gretchen Carmel and guest teachers for a 200-Hour, Yoga Alliance Certified, Mantra Teacher Training & Study Immersion at Blue Spirit Costa Rica. An extraordinary opportunity to immerse in the ancient sound of Sanskrit mantra. Explore the transformative power of chant, ceremony, yoga and meditation amongst the primal beauty of Nosara; the healing waters, pristine jungle coastline and eco-green lifestyle – a sanctuary for spiritual exploration and renewal. 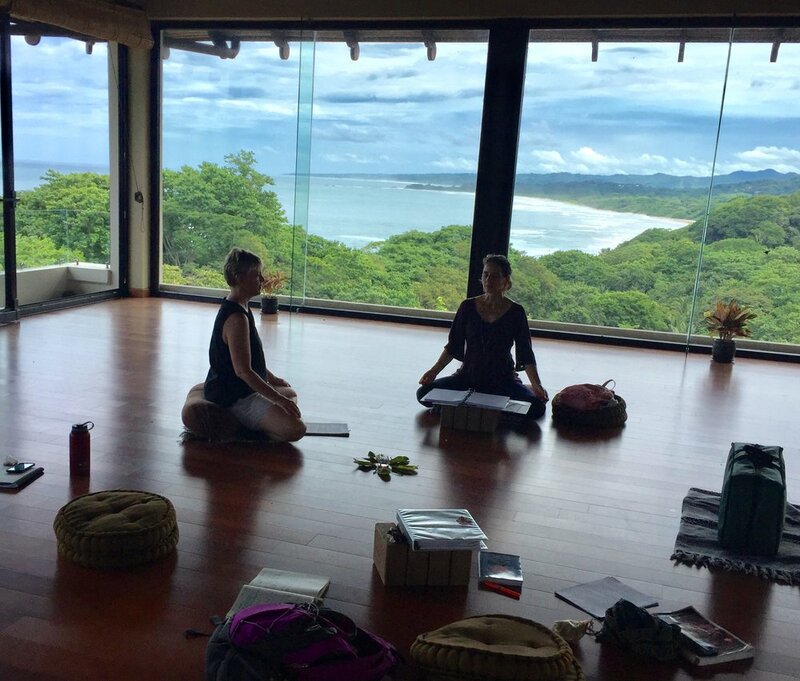 The 200-Hour Mantra Teacher Training & Study Immersion in Costa Rica is a 21-day immersive experience cultivating gifts of true spiritual knowledge, deep personal transformation and rejuvenation, honoring the sacred rhythms of nature in supportive community, in one of the most beautiful places on earth! We’ll honor the rhythm of nature with practices during sunrise and sunset, bathe in the healing elements and immerse in sacred rituals oceanside! This 200-Hour training is certified under Yoga Alliance. We will meet 180 hours of contact training during the 21 days of this retreat. Additional online requirements pre and post retreat, for a total of 20 hours, will be required for completion of certification. We’ll honor the sacred rhythms of nature and embrace each day with early morning chant, meditation and gentle yoga; Morning and afternoon sessions consist of lecture, discussion, study, group chant, practice teach sessions; Evening sessions, when applicable, conclude the day with healing programs, review, integration and relaxation. Ample time is given for delicious gourmet meals with extra free time to explore local adventures or to relax and enjoy Blue Spirit’s amenities; salt-water infinity pool, koi pond, Guiones beach, café, gift shop and spa services. Outdoor excursions such as surf lessons, SUP, horseback riding, waterfall hike and birdwatching can be arranged. Click here for more information on outdoor excursions. Three delicious consciously prepared meals a day, served buffet style, fresh tropical fruits, all local. Airfare, airport transfer, meals and expenses off site, additional required training books and hotel gratuity are NOT included. Super Saver: Register before Feb. 1st, 2018 for the lowest pricing! Training Course Fee drops to $2590.00. Early Bird: Register before May 1st, 2018 for reduced pricing. Training Course Fee only $2790.00. Standard Rates: The standard rates are a great value for registrations May 1-July 21, 2018. Training Course Fee is $3190.00. Group reservations have already been made. Please note it is the policy of Blue Spirit that all retreat participants must be booked in a room on site. These cottages are beautifully situated in lush vegetation, allowing for a sensual being-in-touch experience with nature. They are simple and natural wood frame structures with screening for natural ventilation. Each Cottage sleeps two people (2 twin beds) and has a private bathroom with ambient temperature water shower, or you can use our shared bathhouse with hot water showers. Everything runs on solar powered electricity to provide a comfortable and ecological setting. The Eco-Cottages are situated below the Main Building and involve a short hike up a stone stairway to get to the Main Building. Each Eco-Cottage has a safety box large enough to fit a 17″ laptop computer. *There are approximately 60 full-time Costa Rican local staff, working daily to ensure you have a pleasant and safe stay with housekeeping, kitchen, gardening, security, and more. Blue Spirit will add a per person charge of $60 per week to your room bill for staff tips. These are distributed equally to all of the Costa Rican staff. Meals are prepared with both health and pleasure in mind. The food is fresh and locally and organically grown when available. Each breakfast, lunch, and dinner is served buffet-style. Lunches and dinners include a fresh salad bar. Blue Spirit is one of the foremost world-class yoga and meditation retreat centers and provides an extraordinary setting to all who are dedicated to spiritual transformation, personal development, and environmental sustainability. Perched on a hilltop that overlooks the Pacific Ocean and a three-mile long white sand beach that is protected as a turtle refuge – Blue Spirit offers an extraordinarily beautiful and natural setting on one of Costa Rica’s finest beaches. Located in Nosara on the northwest coast of Costa Rica, Blue Spirit Retreat is remote yet accessible; only a two-hour-drive from the Liberia International Airport, which has frequent daily flights from all over the United States and Canada. Once you arrive, you will find yourself worlds away in a region renowned for its spectacular scenery, excellent restaurants, local cultural events, and an international community that gives the region a vibrantly creative and peaceful atmosphere – a combination you won’t find anywhere else in Costa Rica or perhaps the entire Western hemisphere. Blue Spirit is located in one of the world’s Blue Zones which inspired the name Blue Spirit. According to author Dan Buettner, the Nicoya Peninsula is one of five Blue Zone’s in the world: a Blue Zone is an area where people live the longest and report the highest levels of well-being. While visiting Blue Spirit, you will feel the resonance of a vibrant, inspiring, and healing energy, because of the rich subtropical environment, and the cultural lifestyle. There are two international airports in Costa Rica. Liberia International Airport (LIR) and San Jose International Airport (SJO). It is recommended to fly into Liberia International Airport, as it is the closest airport to Blue Spirit. Blue Spirit Costa Rica offers airport transfers to / from Liberia airport on Saturdays only, at select times. Transportation to and from Liberia airport is only a 2 hour scenic drive from Blue Spirit. The cost ranges from $60 USD per person (3 or more per car) to $180 USD (private transfer), paid directly to Blue Spirit Resort. You are responsible for coordinating and payment of your ground travel to/from the Blue Spirit Retreat Center. If you choose to pre-arrange your ground transfer to/from the resort with Blue Spirit, please submit the Blue Spirit’s Shuttle form. Participants flying into San Jose Airport (3.5 to 4 hours away), or participants flying into Costa Rica early for personal travel will need to arrange their own transportation to and from Blue Spirit. General Check In time for all rooms is 4:00 p.m.
General Check Out time for all rooms is 10:00 a.m. Guests luggage can be stored at the Front Desk at no charge before or after the indicated hours on arrival and departure days. Passports are required to enter Costa Rica, some travelers may require a visa. Identification such as a driver’s license or birth certificate are not valid for travel in Costa Rica. It is advisable to make a copy of your passport, which you will need to carry with you at all times. You should leave your original passport in the safety box at Blue Spirit. No shots or immunizations are required to come to Costa Rica. DEPARTURE TAX: There is a departure tax to be paid of $26 at San Jose or Liberia airport when you leave Costa Rica. It can be paid in cash (US$ or costa rican Colones) or with credit card. All accommodations at Blue Spirit are non-refundable. If cancelled before May 1st, 2018, the training balance may be applied to a future retreat with Rajeshwari within 2 years. If cancelled after the May 1st deadline, forfeit all retreat money rendered.